hallowed in rooms of icons in museums. is another jump at it and I do like it in colour. Thomson today at the AGO and stood in wonder. Chamber's work and felt personally connected to him. me almost as powerfully as his paintings. Labels: portrait. watercolour and marker. Barbara Muir ©. Toronto. Canada. I think you have definately got personality in these 2 portraits of your friend, and they will be great helps if you get a chance to work it out again in acrylic paint, because you will have had a trial run a couple of times with these watercolours. Your friend looks really nice. I wish Tom Thomson was my friend! I do think I am a bit of an old soul... maybe I did know him 100 years ago! He is such an inspiration. Someday I hope you and I will go to the AGO together! I love the colour in this piece. And the gray scale you did the other day! You rock! 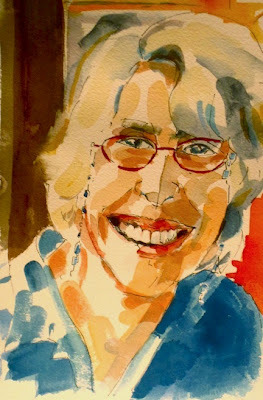 I like this watercolor of your friend. Her smile is contagious! I was unable to bring up Tom Thompson's work .... Error 404 (whatever that means!). I will google him. Jack Chamber's paintings are amazing. I love the one of the little boys watching tv in their pj's with a blanket of snow outside. It's beautiful. And it has that trademark Barbara Muir looseness, colour and joy! This portrait makes me want to meet your friend. A captivating smile. How do you manage painting those teeth? Thanks very much. I love what you're doing with acrylics. I think we can befriend past heroes. When I'm in the gallery I talk to them in my mind. As in "Man you were sooo good." I would love to go to the AGO with you. I'm sorry about that. If you Google him, quite a bit should come up. Jack Chambers was amazing. Thanks so much. I am loving your work. Thanks so much. I wish it was my friend's actual smile which is way more beautiful. But teeth are like everything else. Not harder.